A perennial herb native to North America, this little gem is usually found in the wilds dwelling in rich, moist soil usually near streams, in ditches or marshlands. As a woodland herb, it does well in partially shady areas or sun. I like to show off its vibrant green color by placing it against rocks. This herb is a great addition to any naturalized or wild flower bed, and I think it has its place in the formal garden as well. Because it likes woodlands, we used a lot of organic matter in the grave where our Skullcap resides. 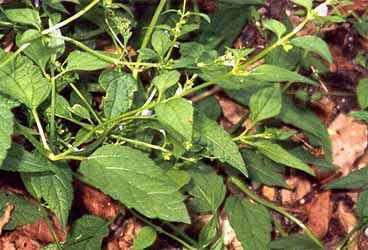 Once known as ‘Mad Dog’ or Madweed based off the belief that this herb would treat rabies, these terms have fallen out of favor as this usage is no longer touted to be true. This herb was and, perhaps still is, used ceremonially by Native American tribes to introduce girls into womanhood. It makes a nice addition to relaxing tea blends, like the Purple Dragon. Bloom: Lavender-blue flowers, May – August. Uses: Nervine, sedative, anti-spasmodic, anti-inflammatory, tonic, febrifuge, emmenagogue, slight astringency. Harvest: Aerial parts. As the plant blooms, cut cleanly with shears about 3” from the soil line. During the first year do a light harvest by cutting to within 5” of the soil line.